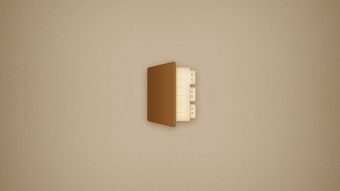 In the following tutorial you will learn how to create a simple address book icon in Adobe Photoshop. Open Photoshop and hit Control-N to create a new document. Enter all the data shown in the following image and click OK. Enable the Grid (View > Show > Grid) and the Snap to Grid (View > Snap To > Grid). For starters you will need a grid every 5px, so simply go to Edit > Preferences > Guides, Grid & Slices and focus on the Grid section. Enter 5 in the Gridline Every box and 1 in the Subdivision box. Also, set the color of the grid to #a7a7a7. Once you have set all these properties click OK. Try not to get discouraged by all that grid, it will ease your work later and keep in mind that you can easily enable or disable it using the Control-“ keyboard shortcut. You should also open the Info panel (Window > Info) for a live preview with the size and position of your shapes. Set the foreground color to #ffde17, pick the Rounded Rectangle Tool, focus on the control panel and set the Radius to 3px. Move to your canvas and simply create a 70 x 95px vector shape. Reselect your yellow rounded rectangles and pick the Rectangle Tool. Hold down the Alt button from your keyboard and simply create a 45 x 95px vector shape as shown in the first image. Make sure that your yellow vector shape stays selected and switch to the Rounded Rectangle Tool. Hold the Shift button from your keyboard and simply add a 15 x 25px rounded rectangle as shown in the second image. Focus on the Layers panel, simply double click on the name of the existing shape and rename “pageOne“. Keep focusing on your “pageOne” vector shape and replace the existing fill color with #f3e7cf. Move the Layers panel and simply double click on your vector shape to open the Layer Style window. Activate the Inner Shadow and enter the properties shown in the following image. Make sure that your “pageOne” is still selected and simply hit Control-J to duplicate it. Focus on the Layers panel, right click on your copy and go to Clear Layer Style. Make sure that your copy stays selected, keep focusing on the Layers panel and lower the Fill to 0%. Open the Layer Style window for the copy made in this step and enter the properties shown in the following images. Reselect your “pageOne” and make a new copy (Control-J). Select it, bring it to front (Shift-Control-] ) then focus on the Layers panel and clear the existing Layer Style attributes. Make sure that the copy made in this step stays selected, keep focusing on the Layers panel and lower the Fill to 0%. Open the Layer Style window for the copy made in this step and enter the properties shown in the following images. Set the foreground color to #0070be, pick the Rounded Rectangle Tool, create a 15 x 25px vector shape and place it exactly as shown in the first image. Make sure that your blue vector shape stays selected and switch to the Rectangle Tool. Hold the Alt button from your keyboard and simply create a 5 x 25px rectangle as shown in the second image. Focus on the Layers panel, simply double click on the name of your new vector shape and rename it “pageTwo“. Keep focusing on your “pageTwo” vector shape and replace the existing fill color with #f3e7cf. Open the Layer Style window for this blue shape and enter the properties shown in the following images. Reselect your “pageTwo” and make a copy (Control-J). Select it, focus on the Layers panel and clear the existing Layer Style attributes. Make sure that your copy stays selected, keep focusing on the Layers panel and lower the Fill to 0%. Open the Layer Style window for the copy made in this step and enter the properties shown in the following images. Reselect your “pageTwo” and make a new copy (Control-J). Select it, focus on the Layers panel and clear the existing Layer Style attributes. Set the foreground color to #39b54a, pick the Rounded Rectangle Tool, create a new 15 x 25px vector shape and place it exactly as shown in the first image. Make sure that your green vector shape stays selected and switch to the Rectangle Tool. Hold the Alt button from your keyboard and simply create a 5 x 25px rectangle as shown in the second image. Focus on the Layers panel, simply double click on the name of your new vector shape and rename “pageThree“. Keep focusing on your “pageThree” vector shape and replace the existing fill color with #f3e7cf. Open the Layer Style window for this new vector shape and enter the properties shown in the following image. Reselect your “pageThree” and make a copy (Control-J). Select it, focus on the Layers panel and clear the existing Layer Style attributes. Make sure that your copy stays selected, keep focusing on the Layers panel and lower the Fill to 0%. Reselect your “pageThree” and make a new copy (Control-J). Select it, focus on the Layers panel and clear the existing Layer Style attributes. Using the Pen Tool, create a 25px, horizontal path and place it as shown in the first image. Make sure that this new path stays selected and focus on the control panel. Make sure that you have no color set for the Fill then set the stroke color to #1b2937 and the stroke width to 1pt. Move to the Layers panel, make sure that your horizontal path is still selected and lower its Opacity to 50%. In the end things should look like in the second image. Make sure that your horizontal path is still selected and make four copies (Control-J). Select these fresh copies one by one and place them as shown in the first image. Reselect all five horizontal lines and simply hit Control-G to Group them. Make sure that your new group is selected, return to the Layers panel, lower its Opacity to 70% and change the Blending Mode to Color Burn. Set the foreground color to #f26522, pick the Rounded Rectangle Tool, create a new 50 x 95px vector shape and place it exactly as shown in the first image. Make sure that your orange vector shape stays selected, focus on its right side and switch to the Direct Selection Tool. Select the top anchor points and drag them 10px up then select the bottom anchor points and drag them 10px down. In the end things should look like in the second image. Move to the Layers panel and simply rename your orange vector shape “cover“. Focus on the Layers panel, open the Layers Style window for your orange vector shape and enter the properties shown in the following images. Reselect your “cover” and duplicate it (Control-J). Select this copy, focus on the Layers panel and clear the existing Layer Style attributes. For the following steps you will need a grid every 1px, so simply go to to Edit > Preferences > Guides, Grid & Slices and enter 1 in the Gridline Every box. Focus on the top, right corner of your “pageOne” vector shape. Set the foreground color to #c69c6d, pick the Rectangle Tool, simply create a 1px square and place it as shown in the first image. Multiply this tiny vector shape (Control-J) and use the copies to create the “A” letter as shown in the second image. Make some new copies and create the “G” letter as shown in the third image. Make some new copies of that little square and use them to create another four letters as shown in the following images. If you choose to create a different letter make sure that you’re not using more than three columns and four rows of squares to create it. Focus on the Layers panel, select all the tiny, squares that make up your letters, simply right click on one of these shape and go to Merge Shapes. Open the Layer Style window for this new vector shape and enter the properties shown in the following image. Hit Shift + Control + Alt + N to create a new layer, select it and send it to back (Shift + Control + [ ). Make sure that this new layer stays selected, pick the Paint Bucket Tool, set the foreground color to #c7b29a and simply click inside your canvas. Open the Layer Style window for this new layer, activate the Inner Glow and enter the properties shown in the following image. Focus on the Layers panel, right click on the layer made in the previous step and go to Convert to Smart Object. Make sure that this new smart object stays selected and go to Filter > Noise > Add Noise. Enter the attributes shown in the following image and click OK.
Focus on the Layers panel, select all the the vector shapes that make up your address book and duplicate them (Control-J). Select these copies and convert them into a new smart object. Make sure that it stays selected and keep focusing on the Layers panel. Lower its Fill to 0% then open the Layer Style window and enter the attributes shown in the following image. Return to the Layers panel and rename the smart object made in this step “shadow“. Duplicate (Control-J) your “shadow” smart object. Open the Layer Style window for this fresh copy and replace the existing attributes with the ones shown in the following images. Duplicate (Control-J) your “shadow” smart object. Open the Layer Style for this fresh copy and replace the existing attributes with the ones shown in the following image. Here is how your final result should look.